A comparative study was done on the dry oils isolated from the leaves and stem portions of Corchrus olitorius (Linn.) growing in Saudi Arabia. Oils were obtained by column chromatography and analysed by Gas Chromatography (GC), Gas Chromatography/Mass Spectrometry (GC/MS) and 13C NMR spectroscopy. The investigation led to the identification of 22 components in leaves oil while as 23 components in stem oil of C. olitorius. On comparison of leaves and stem dry oil components, both the oils were rich in hydrocarbons and fatty acids, but the leaves were found to contain higher percentage of hexadecanoic acid (7, 28.52%) and 2, 4-di tert-butyl phenol (2, 15.01%) as a main components whereas stem dry oil contains ethyl palmitate (6, 26.19%) and 2, 4-di tert-butyl phenol (1, 14.35%) in higher percentage respectively. Also dry oils were tested for antimicrobial and antioxidant activities. Moderate antimicrobial activity with MIC-values between 0.40-0.8 and 1.6->3.2 mg/ml for components of leaves and components of stem oil respectively were observed while as significant anti-oxidant effects were exhibited by both the oil components for DPPH-radical scavenging assay at a dose dependent manner of C. olitorius leaves oil (95.1%) and stem oil (97.1%) at 400 μg/ml respectively. Corchorus olitorius (Linn.) belong to the family Tiliaceae and commonly known as “Jute or Jew Mallow”. It is disturbed throughout the tropical region of Africa and Asia  and is considered as a common vegetable in Egypt, the Philippines, Australia, Senegal and Thailand , as a common weed for India, Afghanistan, Nepal, Kenya and Turkey and as a principle weed for Sudan . Its tender leaves and shoots, rich in proteins and minerals servers as a main dietary source for proteins and are used in ethnic soup preparation in several tropical countries . In the literature survey, Corchorus olitorius is ascribed for several medicinal uses . Its leaves have been reported to be used for the treatment of pain, gonorrhoea, chronic cystitis and tumors . The dried young leaves are diuretic, demulcent, tonic and slightly febrifuge; infusion of dried leaves is used to restore appetite and strength . Its seeds are purgative and have been reported to exhibit estrogenic activity  as well as effective in cardiac diseases due to presence of appreciable amounts of active cardiac principles in particular Olitoriside, which showed equivalent effect to strophanthin with chronic cardiac patients . The stem acts as a main source of jute fiber . In addition to this, it is an ingredient in lotions, facial and hand creams and hair tonics . Moreover, pharmacologically C. olitorius possesses a diverse biological activities which includes, antioxidant , anti-tumor , hypoglycemic , antimicrobial , anti-inflammatory, analgesic , antiobesity , gastroprotective  and wound healing effects . Further more extensive phytochemical investigation showed presences of cardiac glycosides: coroloside, veticoside, erysimoside, helveticoside, corchoroside A, corchoroside, B, strophanthidol, evonoside, strophanthidin, olitor and chorchorusoside A-E from the seeds ; triterpenes, intones, steroids, acidic polysaccharide rich in uronic acid and consisting of rhamnose, glucose, galacturonic acid and glucuronic from the leaves  while as root contains corosin, β-sitosterol and triterpene . Thus the excellent chemical and biological profile of C. olitorius promoted to further investigate the useful chemical entities from different parts of the plant, which led to isolation of dry oils from the leaves and stem portion of C. olitorius. The C. olitorius was collected from local market of Saudi Arabia, where it is locally known as ‘Molokhia’ and consumed as a popular vegetable. The present paper describes isolation of dry oils, identification of components and comparison leaves and stems dry oil by using GC/Gas Chromatography linked to Mass Spectroscopy (GC-MS), Carbon-13 nuclear magnetic resonance (13C NMR) technique and evaluation of antimicrobial and antioxidant activities of each dry oil obtained. To the best of our knowledge this the first comparative study of dry oils obtained from different portions of C. olitorius. The fresh plant was purchase from local market at Riyadh, S.A in June 2016. The leaves and stem of C. olitorious were separated from each other, air-dried and then coarsely powdered to give powdered leaves (456 g) and stem (65 g). The plant materials were identified by Dr. Mahmoud Abdul Aziz Mahmoud, College of Food and Agricultural Sciences, KSU. Voucher specimens (HM37-1) for leaves and (HM37-2) for stem were deposited in department of Pharmacognosy, college of pharmacy, KSU. The solvents used were ethanol 95%, acetone, petroleum ether 40-60°C, chloroform, methanol, butanol and ethyl acetate, which were distilled prior to use. Analytical grade solvents were used for chromatography and crystallization while those used for extraction processes were General Purpose Reagents (GPR). Spectroscopic grade and deuterated solvents were used for spectral analyses. The leaves and stem of C. olitorius were separated from each other, air dried and then powdered leaves (456 g) and stem (65 g) were exhaustively extracted with 96% alcohol at room temperature. The alcoholic extract was evaporated under vacuum to obtain 45.1 g and 63.3 g of dark green residues for leaves and stem respectively. Each residue obtained was suspended in mixture of water-methanol (9:1) individually and successively partitioned successively with petroleum ether (3 × 0.5 L), chloroform (3 × 0.5 L), ethyl acetate (3 × 0.5 L), nbutanol (3 × 0.5 L) to get petroleum ether (CCL1, 4.8 g), CHCl3 (CCL2, 5.2 g), EtOAC (CCL3, 4.2 mg), n-BuOH (CCL4, 5.0 g) for leaves and petroleum ether (CCS1, 5.4 g), CHCl3 (CCS2, 6.2 g), EtOAc (CCS3, 9.5 mg), n-BuOH (CCS4, 8.5 g) for stem residue respectively. All the fractions were stored in refrigerator prior to its use. The chloroform fraction for leave (CCL2, 5.2 g) and stem CHCl3 (CCS2, 6.2 g) were individually chromatographed over silica gel column (250 g, 2.5 cm) and eluted with n-hexane-ethylacetate (8:2), gradually increasing the percentage of ethyl acetate in n-hexane, nhexane- ethylacetate (7:3), n-hexane-ethylacetate (6:4) and final elution with 100% ethyl acetate. Fractions eluted in n-hexaneethylacetate (7:3) were combined on the basis of similar TLC pattern and subjected to recrystallization to obtain 8.2 mg of greasy solid for leaves and 12.0 mg for stem respectively. The GC-MS analysis was performed in a Perkin Elmer Clarus 600 gas chromatograph inked to a mass spectrometer (Turbomass) available at Central Laboratory, College of Pharmacy, King Saud University, Riyadh. An aliquot of 2 μL of extract was injected into the Elite-5 MS column of 30 m, 0.25 μm film thickness, 0.25 μm internal diameters. The GC-MS system starts with the initial oven temperature of 40ºC and hold for 2 min then up to 200ºC increase with the rate of 5ºC/min and hold to 2 min. From 200ºC again at the rate of 5ºC reach the column oven temperature to 300ºC and hold for 5 min. The injector temperature was maintained at 280ºC. The interface temperature was 240ºC and the source temperature was at 220ºC. Pressure of the system was maintained at 1.11 e-5 and the electron energy was at 70 eV. Helium was used as a mobile phase at a flow rate of 1.0 ml/min. Mass spectral detection was carried out in electron ionization mode by scanning at 40 to 600 (m/z). Finally, unknown compounds were identified by comparing the spectra with that of the National Institute of Standard and Technology and WILEY library. The total time required for analysing a single sample was 61 minutes. 13C-NMR spectra of samples components of leaves and components of stem were recorded on a Bruker AM700 operating at 176.0 MHz for 13C NMR, (Bruker Topspin Gmbh, Rheinstetten) NMR spectrometer (Research center, college of pharmacy, King Saud University) equipped with a 5 mm probe, in deuterated chloroform. The spectra were recorded with the following parameters: pulse width (PW): 12 μsec, Acquisition Time (AQ): 0.786432 sec for 295.0 K data table with Spectral Width (SW) of 41666.668 Hz (250 ppm). The number of accumulated scans was (NS) 3000 for each sample. An exponential multiplication of the free induction decay with the line broadening of 0.1 Hz was applied before transformation. The components were identified on the basis of GC retention time and matching with Wiley 2006 library as well as by comparison the fragmentation patterns of their mass spectra with those reported in the literatures [22,23] and most of the identified components were higher alkanes and alcohols. A total of 22 and 23 detectable peaks were selected for Components of leaves oil and components of stem oil respectively. Antimicrobial activity: Microorganisms: American Type of Culture Collection (ATCC) standard against various microorganisms namely, Staphylococcus aureus (ATCC25922), Escherichia coli (ATCC25923), Pseudomonas aeruginosa (ATCCPAO1) and Candida albicans (SC315) were used. An earlier adopted agar well diffusion method, [24,25] was used. The 0.1 ml of diluted inoculum (105 CFU/ml) of test organism was spread on Muller-Hinton agar plates. Wells of 8 mm diameter were punched into the agar medium and filled with 100 μl of plant extracts and 100 mg/ml concentration of dry oils and solvent blank (DMSO) separately. The plates were incubated for overnight at 37°C. The antibacterial activity was evaluated by measuring the zone of inhibition against test organism. Antibiotics (Ampicillin and Doxycycline) were used as positive control against bacteria while Nystatin was used as the control antifungal drugs. Each experiment was performed in triplicate . Minimum inhibitory concentration of plant extracts as well as dry oils against drug resistant clinical strains was determined by broth dilution method, using specific dye (p-iodonitro tetrazolium violet) as an indicator of growth as described by . Briefly, 2 ml of the plant extracts and dry oils were mixed with 2 ml of Muller-Hinton broth (Hi-Media Ltd., Mumbai, India) and serially diluted into the next tube and so on. 2 ml of an actively growing culture of different test strains was added before incubating for overnight, at 37°C. After examining turbidity visually, 0.8 ml of 0.02 mg/ml indicator dye (piodonitro tetrazolium violet) was added to each tube and incubated at 37°C. The tubes were examined for the color development, after 30 min. Absence of growth was also confirmed by spreading 0.1 ml of broth from each test tube on normal nutrient agar plates. MIC is defined as the minimum concentration of plant extracts as well as dry oils which inhibited the visible growth of test strains. All experiments were performed in triplicates and the data obtained from experiments were presented as mean values and the difference between control and test were analysed using student’s t test. Statistical analysis is done on Sigma plot 12. C. olitorius is a native plant of tropical Africa and Asia. Its leafy vegetable is popularly used in soup preparation and folk medicine. A comparative study was carried out on dry oils isolated from the leaves and stem parts of C. olitorius. Pale yellow coloured dry oil with a distinctive odor, was obtained by individual column chromatography of chloroform fractions of leaves and stem portion of C. olitorius. Isolated dry oils were analysed by Gas Chromatography (GC), Gas Chromatography/Mass Spectrometry (GC/MS) and identification of individual components was done by 13C NMR spectroscopy. Gas chromatography and Gas chromatography- Mass spectroscopy analysis of isolated dry oils showed the presence of twenty two components in leaves oil (Table 1) while as twenty three components in the stem oil (Table 2) respectively, which were identified by 13C NMR. On comparison between leaves and stem dry oil, results showed that both the oils are composed of similar types of hydrocarbons and fatty acids, but the percentage of hexadecanoic acid (7, 28.52%), 2, 4-di tert-butyl phenol (2, 15.01%), tetratetracontane (19, 7.77%), tritetracontane (22, 6.17%) and 9-eicosene (4, 5.31%) components was in leaves oil whereas stem oil contains ethyl palmitate (6, 26.19%), 2, 4- di tert-butyl phenol (1, 14.35%), 1-eicosanol (23, 8.27%), tetratetracontane (16, 7.02%), 8-heptadecene (3, 5.33%), hexatriacontane (18, 5.16%) in higher percentage (Figures 1-6). The 13C NMR spectra were recorded in CDCl3 showed approximately similar protonated carbons signals in both components of leaves oil as well as stem oil (Figures 7 and 8), which is consistent with the GC and GC/MS results and with those common hydrocarbons. Thus the results obtained describe the first detailed analysis of C. olitorious leaves and stem dry oil. Our results showed slightest differences between the components of leaves and stem dry oils and also describes the variations of the contents of the main components, the plant produces dry oil belonging to the same chemotype during its life. 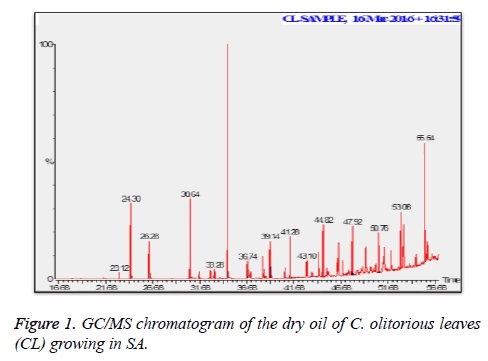 Figure 1: GC/MS chromatogram of the dry oil of C. olitorious leaves (CL) growing in SA. 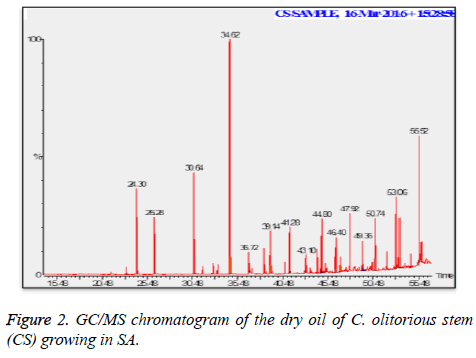 Figure 2: GC/MS chromatogram of the dry oil of C. olitorious stem (CS) growing in SA. 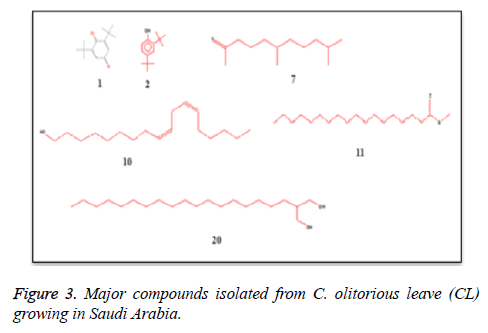 Figure 3: Major compounds isolated from C. olitorious leave (CL) growing in Saudi Arabia. 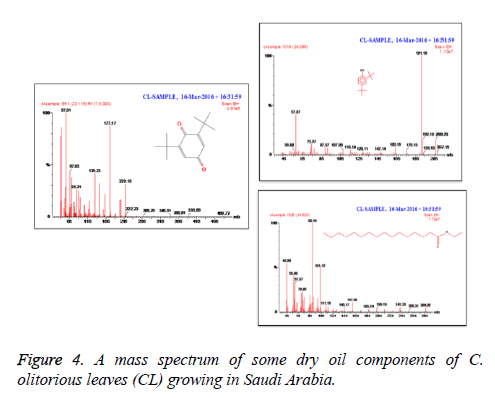 Figure 4: A mass spectrum of some dry oil components of C. olitorious leaves (CL) growing in Saudi Arabia. 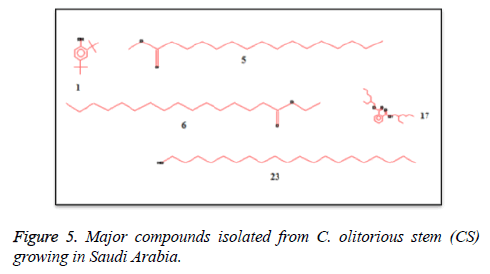 Figure 5: Major compounds isolated from C. olitorious stem (CS) growing in Saudi Arabia. 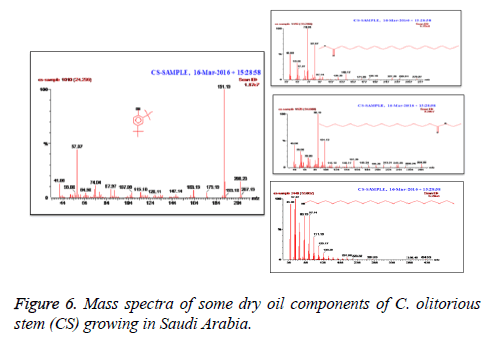 Figure 6: Mass spectra of some dry oil components of C. olitorious stem (CS) growing in Saudi Arabia. Figure 7: 13C NMR spectrum (176.0 MHz, CDCl3) of C. olitorious leaves (8.2 mg, CL). NS=3000, AQ=0.786432 sec. Figure 8: 13C NMR spectrum (176.0 MHz, CDCl3) of C. olitorious stem (12 mg, CS). NS=3000, AQ=0.786432 sec. Table 1. Chemical composition of the dry oil of the C. olitorious leaves (CL) growing in SA. Table 2. Chemical compositions of the dry oil of the C. olitorious stem (CS) growing in SA. Dry oils were evaluated for their antimicrobial and antioxidant activities. Results showed that both dry oils from C. olitorious possessed antibacterial and antifungal activity against all of the tested gram positive and gram negative bacterial and fungal strain (Tables 3 and 4), with the diameters of zone inhibition ranging between 11-13 mm and 13-16 mm for components of leaves oil and components of stem oil respectively. The most significant activity was observed for components of stem dry oil and inhibited the growth of all the bacterial strains tested, specifically S. aureus, E. coli (16 mm). Furthermore, antifungal results showed, C. albicans was susceptible to components of leaves oil and components of stem dry oils (11 and 16 mm), with MIC-values between 0.40-0.8 and 1.6->3.2 mg/ml for components of leaves oil and components of stem dry oil respectively. Also study on was conducted petroleum ether extract of C. olitorius leaves and offered a good activity against Escherichia coli, Staphylococcus aureus and Yersinia enterocolitica, 20 mm, 19 mm and 19 mm, respectively. The results concluded in this study appear to emphasize on the antibacterial and antifungal potential of C. olitorius leaves, as well as its helpfulness in the treatment of diseases that might be as a cause of infection . Moreover, the DPPH-radical scavenging assay exhibited a significant antioxidant activity at a dose dependent manner of C. olitorius components of leaves oil and components of stem dry oils (95.1 and 97.1%) at 400 μg/ml (Table 5) respectively. Table 3. Antimicrobial activity of CL and CS dry oils as inhibition zones (mm). Table 4. Minimum Inhibitory Concentration (MIC) of CL and CS dry oils against bacterial and fungal strains. Table 5. Free radical scavenging activity of dry oils by DPPH. Duke JA. Corchorus olitorius L. Handbook of energy crops 1983. Zeghichi S, Kallithkara S, Simopoulus AP. Nutritional composition of Molokhia (Corchorus olitorius) and Stammagathi (Cichorium spinosum) in plants, in human health and nutritional policy. Simopoulus, APC Gopalan (Eds.) Karger Basel 2003; 1-21. Holm LG, Pancho JV, Herberger JP, Plucknett DL. A geographical atlas of world weeds. John Wiley Sons NY 1979. Zeghichi S, Kallithraka S, Simopoulos AP. Nutritional composition of molokhia (Corchorus olitorius) and stamnagathi (Cichorium spinosum). World Rev Nutr Diet 2003; 91: 1-21. Duke JA, Wain KK. Medicinal plants of the world. Computer index with more than 85,000 entries. Longman group UK Limited 1981. Abu- Hadid AF, El-Shinawy MZ, El-Bethagy AS, Gaafer SA, Medany M. Studies on the production of off-season Jews mallow (Molokhia) in Egypt. Egypt J Hort 1994; 21: 187-193. Nishiumi S, Yabushita Y, Fukuda I, Mukai R, Yoshida K, Ashida H. Molokhia (Corchorus olitorius L.) extract suppresses transformation of the aryl hydrocarbon receptor induced by dioxins. Food Chem Toxicol 2006; 44: 250-260. Sharaf A, Kamel SH, Salama A, Arbid MS. Oestrogenicity of Corchorus olitorius seed oil. Egypt J Vet Med 1979; 14: 87-93. Samilova RD, Lagodich TA. Olitoriside-a glycoside from the seeds of Corchorus olitorius L. Vrach Delo 1977; 27-31. Kirtikar KR, Basu BD. Indian medicinal plants Dehra Dun: International Book Distributors (2nd edn.) 1987; 3. Pal DK, Mandal M, Senthilkumar GP, Padhiari A. Antibacterial activity of Cuscutare ?exa stem and Corchorus olitorius seed. Fitoterapia 2006; 77: 589-591. Oboh G, Raddatz H, Henle T. Characterization of the antioxidant properties of hydrophilic and lipophilic extracts of Jute (Corchorus olitorius) leaf. Int J Food Sci Nutr 2009; 60: 124-134. Furumoto T, Wang R, Okazaki K, Hasan AFMF, Ali MI, Kondo A, Fukui H. Antitumor promoters in leaves of jute (Corchorus capsularis and Corchorus olitorius). Food Sci Technol Res 2002; 8: 239-243. Abo KA, Fred-Jaiyesimi AA, Jaiyesimi AE. Ethnobotanical studies of medicinal plants used in the management of diabetes mellitus in South Western Nigeria. J Ethnopharmacol 2008; 115: 67-71. Semra I, Filiz S, Ferdag C. Antibacterial and antifungal activity of Corchorus olitorius L. (Molokhia) extracts. Inter J Natural Engineering Sci 2007; 1: 59-61. Wang L, Yamasaki M, Katsube T, Sun X, Yamasaki Y, Shiwaku K. Antiobesity effect of polyphenolic compounds from molokheiya (Corchorus olitorius L) leaves in LDL receptor-deficient mice. Eur J Nutr 2011, 50: 127-133. Ismail IF, Golbabapour S, Hassandarvish P. Gastroprotective activity ofPolygonumchinense aqueous leaf extract onethanol-induced hemorrhagic mucosal lesions in rats. Evid Based Complement Alternat Med 2012; 2012: 404012. Barku VYA, Boye A, Quansah N. Antioxidant and wound healing studies on the extracts of Corchorus olitorius leaf. World Essays J 2013; 1: 67-73. Rao EV, Rao KN, Rao DV. Polar glycosides of the seeds of Corchorus olitorius. Ind J Pharm 1972; 34: 168. Yoshikawa M, Shimada H, Saka M, Yoshizumi S, Yamahara J, Matsuda H. Medicinal Foodstuffs. V Moroheya (1): Absolute stereostructures of corchoionosides A, B and C, histamine inhibitors from the leaves of Vietnamese Corchorusolitorius L. (Tiliaceae). Chem Pharm Bull 1997; 45: 464469. Consolacion YR, Julius LAV, Maria CST, Chien-Chang S. Chemical constituents of Corchorus olitorius (Linn.). Inter J Pharmacognosy Phytochem Res 2016; 8: 2085-2089. Adams RP. Identification of essential oil components by GC-MS. Allured Publ Corp Carl Stream 1995. Mclafferty FW, Staffer DB. The Eiley NBS registry of mass spectral data. Wiley Int Public 1989; 1-7. Perez C, Pauli M, Bazerque P. An antibacterial assay by agar well diffusion method. Acta Bio Et Med Exp 1990; 15: 113-115. Ahmad I, Beg AZ. Antimicrobial and phytochemical studies on 45 Indian medicinal plants against multi-drug resistant human pathogens. J Ethnopharmacol 2001; 74: 113-123. National committee for Clinical Laboratory Standards, Performance Standards for Antimicrobial Susceptibility Testing. 12th Informational Supplement M100 S12 NCCLS Wayne PA MSA 2002. Eloff JN. A sensitive and quick microplate method to determine the minimal inhibitory concentration of plant extracts for bacteria. Planta Med 1998; 64: 711-713. Gyamfi MA, Yonamine M, Aniya Y. Free-radical scavenging action of medicinal herbs from Ghana: Thonningia sanguinea on experimentally-induced liver injuries. Gen Pharmacol Vasc Syst 1999; 32: 661-667. Ilhan S, Savaroglu F, Çolak F. Antibacterial andantifungal activity of Corchorusolitorius L. (Molokhia) extracts. Int J Nat EngSci 2007; 1: 59-61.